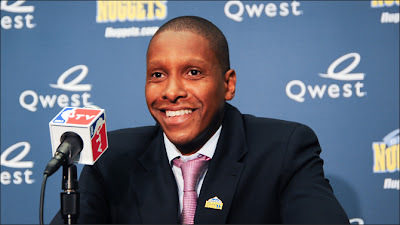 Masai Ujiri (born ca. 1970) is the general manager of the Denver Nuggets of the NBA. A native of Zaria, Nigeria, he is the first African-born general manager for an American major league sports team. The son of a doctor and a hospital administrator, Ujiri originally played soccer as a youth before focusing on basketball. He admired Hakeem Olajuwon, an NBA star who was born in Nigeria. Ujiri played college basketball in the United States at Bismarck State College, then transferred to Montana State University-Billings, though he left the latter school after one semester. He spent six years playing professionally in Europe, then, with the help of David Thorpe, became an unpaid scout for the NBA's Orlando Magic. The following season, the Denver Nuggets offered him a paid scouting position, and after four seasons there, he joined the Toronto Raptors as their Director of Global Scouting. He became the Raptors' assistant general manager in 2008, and returned to the Nuggets in 2010, when he accepted his current position. Ujiri has also been the director of the NBA's Basketball Without Borders Africa program, which promotes basketball throughout the continent.